The Wheelersburg Dial-A-Ride demand response, curb-to-curb, same day, shared ride public transit service is available in the Wheelersburg, Ohio (Porter Township) area. Door-to-door service is also available by request for those needing reasonable assistance beyond the curb. 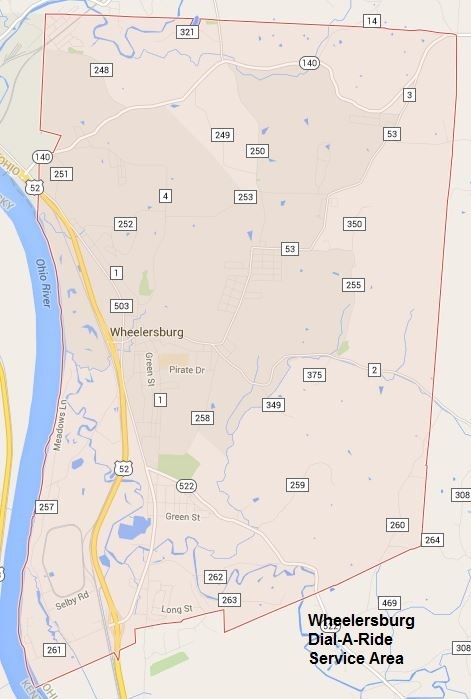 The Wheelersburg Dial-A-Ride is a public transportation service so anyone can ride. Riders must share the bus with others who are traveling at the same time and same direction. To get a ride just call the Dial-A-Ride line at 740-353-5165 anytime Monday through Friday between 8:00 a.m. and 4:00 p.m. and tell us who you are, where you are, and where you would like to go. The Dial-A-Ride bus will be sent to your pickup location as soon as possible. The Dial-A-Ride service is on a first come, first served basis, however you can also call and schedule at trip for later the same day. Hearing-Impaired persons can call the Ohio Relay Service at 800-750-0750 for assistance in requesting a ride. When you call for a trip please let us know if you have any special needs such as you are using a wheelchair or other mobility device, or have any attendant or service animal, etc. The Wheelersburg Dial-A-Ride service is designed to supplement Access Scioto County's regular countywide service. If you wish to go somewhere else in Scioto County please call the Access Scioto County main office at 740-353-5626, ext. 203 to schedule your transportation. Passengers are permitted bring Non-Service animals on board the Dial-A-Ride bus, however they must be caged and remain under the control of the owner. Once you call the Dial-A-Ride service the bus will be sent to your pickup location as soon as possible. Your wait time for the bus to arrive will depend on the demand of the service at the time of your call. Please be ready to go and be outside or waiting where you can see or hear the bus and be seen by our driver after you call for your pickup. If you change your mind or get a ride from someone other than us please call us back and let us know that you don't need us to pick you up. It is our mission to provide safe and reliable public transportation and to this end we require all our passengers to wear seat belts at all times when the vehicle is in motion. Also for your safety, when arriving at your stop, please remain seated with your seat belt fasten until the vehicle comes to a complete stop. This will reduce the risk of falls. In accordance with Ohio's Child Passenger Safety Law, child safety seats must be used, when appropriate. The child safety or booster seat are the responsibility of the child's parent or guardian. All passengers using wheelchairs or other mobility devices are required to have their wheelchair or mobility secured. Anyone refusing to wear a seat belt or have their wheelchair or mobility device secured can and will be denied service for safety reasons. In the event of an accident, illness or injury please follow your driver's instructions. An adult must accompany all children younger than 9-years old unless the child's parent or guardian has made prior arrangements. For your safety all our driver's and other safety sensitive employees are required to undergo random drug and alcohol testing, criminal background checks and motor vehicle reports. Your driver is expected to provide safe, courteous, and helpful service. If this is not the case you are encouraged to report the driver to the management of Access Scioto County. Our service is shared ride service so you may be required to share the bus with others. We request that you be respectful and courteous to all the other passengers and your driver. Please don't eat, drink, smoke, vape, chew, dip, play loud music, cuss, or touch or disturb others on the bus. We reserve the right to refuse service to anyone who poses a health or safety risk to our employees or other passengers. Verbal abuse, profanity, illegal acts, or weapons, unruly behavior, or threats, or acts of physical violence will not be tolerated. Anyone engaging in such activities will no longer be eligible to use our service. Our service is provided from the curb at your pickup point to the curb at your destination. The driver may assist you to and from the curb when boarding or leaving the bus, however they are not permitted to enter a residence or building. A Personal Care Attendant (PCA) may accompany you on your trip at no charge, however you must notify us in advance of your pickup . Your PCA must sit in close proximity to you, be responsible for assisting you, and is required to stay with you from you pickup point to your destination. Your driver will tie down all wheelchairs and other mobility devices, help secure packages, and assist with seat belts if needed. Passengers are requested to limit their carry-on bags and packages to eight (8)- paper or sixteen (16) plastic bags. The bags need to be small enough not to obstruct other passengers and stored out of the aisles. It is the responsibility of the passenger or their PCA to load and unload bags or packages. The driver is allowed to assist you, if you request, however they are not permitted to handle bags or packages that weigh over 25-pounds each. Passengers are permitted to carry a portable oxygen bottle on our bus, however the passenger is responsible to maintain control of the oxygen bottle. If the passenger can not pull, carry, or maintain control of the oxygen bottle a PCA can perform those functions for the passenger.